Leaders in the music industry joined together in 1983 to establish the Rock and Roll Hall of Fame Foundation. One of the Foundation's many functions is to recognize the contributions of those who have had a significant impact on the evolution, development and perpetuation of rock and roll by inducting them into the Hall of Fame. . This bronze coin was created to honor the 2018 Inductee class. 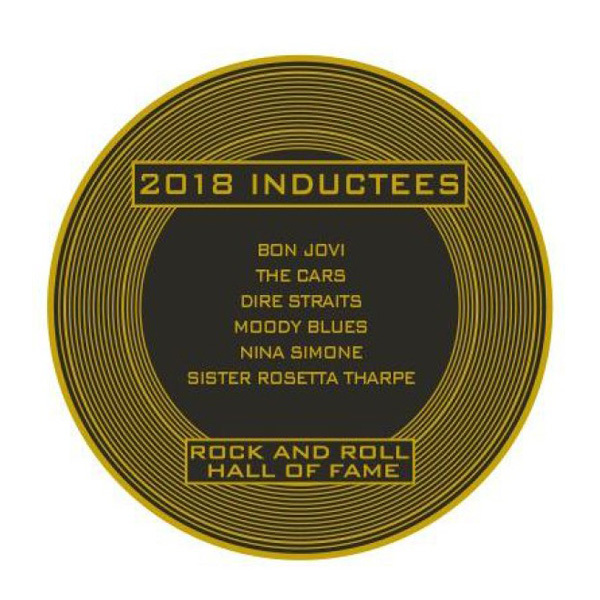 Bon Jovi, The Cars, Dire Straits, The Moody Blues, Nina Simone and Sister Rosetta Tharpe join those inductees who came before them and shaped the world of rock n' roll. The front of the coin displays the class year and a rendering of the museum. Back of the coin displays the class year and a list of the year's Inductees. Each coin comes in a decorative box and includes an antique bronze plated coin, a solid black wood stand to display the coin, and a pamphlet noting facts about each Inductee. . Antique bronze plated coin measures 3" in diameter.